They are right on target with the Lasagna at Pasta Market! September 10, 2015 September 10, 2015 ~ Trevis Dampier Sr.
Lasagna is believed to be one of the earliest types of pasta. These thin and wide noodles are most frequently layered in a dish with other savoury ingredients and baked to create a dish called – you guessed it – lasagna. Italian food is truly one of the oldest forms of soul food out there! It brings families together for conversation and laughter and goes great with red wine! We , American’s lose our mind over it.. Especially pizza! We’ll eat pizza for lunch..
On the electric chair, for the last meal , if they are American they would want pizza..
Other than the food on the go like pizza, the next best item that I love outside of spaghetti is lasagna; and Pizza Market sure knows how to get down with the get down on this dish.. So it’s lunch time and I’m in need of something wholesome and soothing to the soul. Something hearty and flavorful that will do more than just fill me up but leave me in a state of joy and warmth internally. I begin the drive to this small castle of mythical lasagna made with oozing cheese, perfectly cut lasagna noodles, mouth watering tomato sauce and succulent beef, while day dreaming about family dinners when I was a young boy. We used to love lasagna nights..
My mom would spend hours cooking it in the oven with garlic bread on the side and we would all just moan and groan over the table together while having conversation or just listening to the sound of lips smacking together. There was never an end to those days and every now and again she will cook up a lasagna dish for us to enjoy with the next generation and continue with new moans and groans. So Pasta Market is just like it sounds; it is a pasta market. They have fresh ingredients that you can purchase there to create your own Italian dishes but you also have the choice to dine there as well. 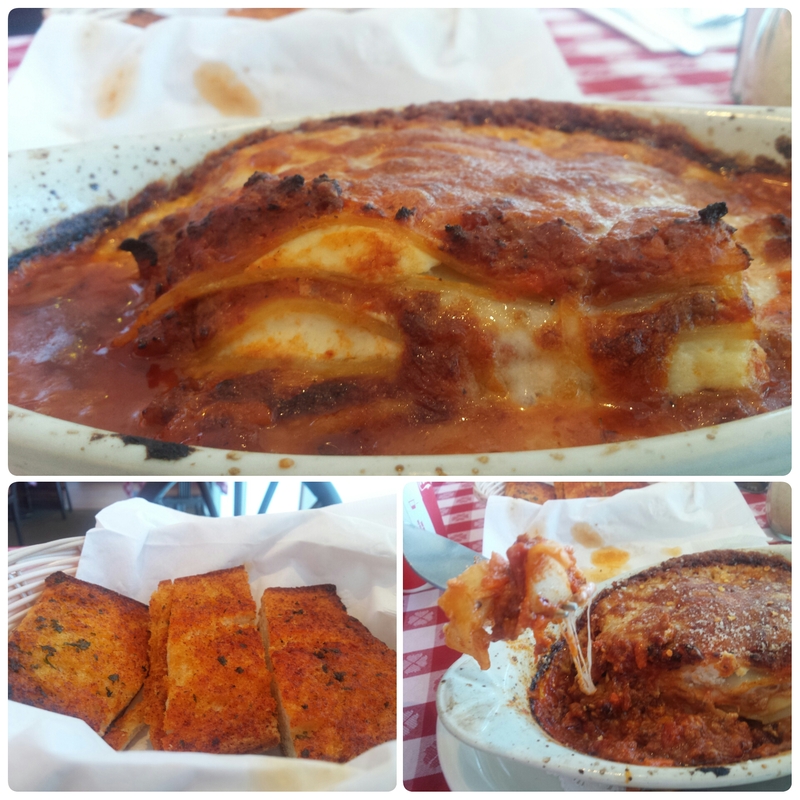 I go there strictly to eat their cooked dishes and I have tried their pizza and lasagna before and both are superb! Today, I am here for one purpose and one purpose only; to have the meat lasagna with rich flavored garlic bread. I place my order in and await this masterpiece to arrive while sitting at my chair quivering inside smelling the tempting aroma of Italian delights in the air. My meal arrives and the plate is making sizzling noises with the small grease puddles in the corners while the cheese swims in motion on top of the noodles. The sauce glistens in the light and sparkles with a gleam of utmost extravagance. The garlic bread has an aroma of pure heavenly satisfaction that leaves you breathless when you take a whiff. I cut into the lasagna and steam arises and the cheese holds onto the fork and the lasagna like a trapeze acrobat doing the splits. The cheese is like a rubber band and just stretches and stretches as you pull your fork away. It is super hot but I can’t wait anymore to bite it.. I feel like I am going to have an anxiety attack.. Complete erotica in my mouth!! Yum!! For each chewing sensation, I am tasting a delicious tomato sauce, combined with a flavorful beef, oozing rich cheese and perfectly sized lasagna noodles. Then I take a slice of the garlic bread and dip it into the rich tomato sauce and cheese and dive into that..
Oh man.. The garlic covered land of peace and tranquility upon this bread is just plain goodness. Just a ridiculous combination of great crunch and taste that matches perfectly with the lasagna. Bite after bite..Moan after moan… Superior satisfaction! True live action eating! Good job Pasta Market! < Previous Happy Barbecue Labor Day! Next > I must be deranged for not eating more PF Chang’s!